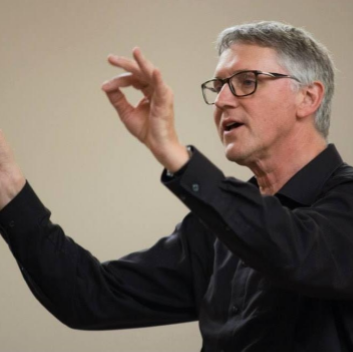 Gilles Michels (1961) is the main conductor of the Utrecht Student Choir and Orchestra since 2009. He studied at the Conservatories of Amsterdam and Rotterdam. He was teacher and conductor of several famous Dutch children’s choirs, including the Dutch National Children’s Choir, the Rotterdam Boy’s Choir and the St. Bavo Choir School in Haarlem. In the past few years his field of work has shifted from acapella music to the performance of vocal-instrumental works, such as J.S. Bach’s cantatas and major works of Händel, Mozart, Schubert, Brahms,Verdi, Britten and Poulenc. Gilles is the main conductor of the Leiden Student Music Society “Collegium Musicum”, The Hague Baroque Society, Collegium Musicum Traiectum and CHOIR Delft.